Dora Gerson (23 March 1899 – 14 February 1943) was a German cabaret singer and motion picture actress of the silent film era who died with her family at Auschwitz concentration camp. 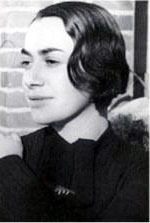 Born Dorothea Gerson into a Jewish family in Berlin, Gerson began her career as a touring singer and actress in the Holtorf Tournee Truppe alongside actor Mathias Wieman in Germany where she met and married her first husband, film director Veit Harlan. The couple married in 1922 and divorced in 1924. Harlan would later direct the anti-Semitic Nazi propaganda film Jud Süß (1940), supposedly at the insistence of Nazi Propaganda Minister Joseph Goebbels. In 1920, Gerson was cast to appear in the successful film adaptation of the Karl May-penned novel Auf den Trümmern des Paradieses (On the Brink of Paradise) and later followed that same year in another May adaptation titled Die Todeskarawane (Caravan of Death). Both films included Hungarian actor Béla Lugosi in the cast. Both films are now lost films. Gerson continued to perform as a popular cabaret singer throughout the 1920s as well as acting in films. In 1936, Gerson relocated with relatives to the Netherlands, fleeing Nazi persecution. She had married a second time to Max Sluizer (b. 24 June 1906). On 10 May 1940, Germany invaded the Netherlands and the Jews there were subject to the same anti-Semitic laws and restrictions as in Germany. After several years of living under oppressive Nazi occupation, the Gerson family began to plan to escape. In 1942, Gerson and her family were seized trying to flee to Switzerland, a neutral nation in World War II Europe. The family were sent by railroad car to transit camp Westerbork bound for the Nazi camp of Auschwitz in Nazi-occupied Poland. Dora (aged 43), along with her husband and their two children, Miriam Sluizer (b. 19 November 1937) and Abel Juda Sluizer (b. 21 May 1940), died at Auschwitz on 14 February 1943. ^ Schönfeld, Christiane; Finnan, Carmel (2006). Practicing Modernity: Female Creativity in the Weimar Republic. Königshausen & Neumann. p. 209. ISBN 978-3-8260-3241-7. Dora Gerson singing "Der Rebe Hot Geheysn Freylekh Zayn"
This page was last edited on 12 April 2019, at 19:25 (UTC).